These sessions will take place by arrangement. 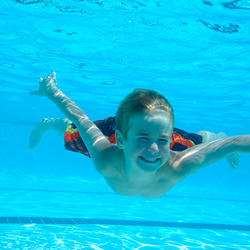 We will ask you to get your child ready and pop them in the water at your allocated time. There will be an assistant available to help your child in the water. The photographer will then take around a minute of HD video with an underwater camera. We then frame grab the best image available. We use video to ensure that we have many images to work with from the video. There is nothing worse than having an image of your child with one eye closed! The image is then printed on to high quality gloss paper and mounted in a frame. The photo is delivered the following week. The photographer is fully CRB checked and is a permanent member of the Lichfield Dolphins team, not from an outside agency. We charge £25.00 for each framed 10 x 8 inch print. If you would also like 2 smaller images to give to friends or grandparents these will be charged at £10.00 for two. The smaller images are 7 x 5 and are mounted but not in a frame. All images must be paid for in advance of the session. If you would like more information or would like to book please contact us to arrange an appointment.